We aim to inspire people to live a better life by taking care of their body but that ambitious goal starts with a dedicated and passionate team. We are always seeking talented individuals to join our team and make a difference in people’s lives. Our team benefits from the relationships we build in our communities. We offer you exclusive discounts with our family of brand partners. We take pride in offering competitive compensation so you can benefit the most in your career. We believe in offering you some personal time as life can get busy. So we offer a sweat program, through our partners, which provides access to various wellness facilities across each region. Whatever career path you follow, we provide 1-on-1 mentorship to help you grow into your role. We believe in empowering you through education so you can thrive in your career. We're carving out a new lane in our industry, which affords us new opportunities. We offer development program so you can explore exciting, new careers paths within our company. We connect with our community through , we provide all team members opportunities to be building relationships and to explore and find new connections. At Myodetox, we rely on talented, driven and ambitious individuals to help push our company forward. You are our number one investment, and we dedicate our resources to you. We set out to develop your skills and put you in the best position to succeed, so your career path has every opportunity to grow within all areas of the company. As a Myodetox Therapist your journey begins, your focus is to grow your craft and learn to provide a world class client experience. Along the way you will explore and learn about the different pillars that make up the Myodetox business. As an Employee Wellness Lead your passion lies in working with companies to improve their employee wellness. Working with corporate offices to educate, optimize and bring awareness to self care. Creating connection is your strongest attribute. You have a natural talent for building relationships in your community, whether it’s your local partners or you expanding your network. As a Clinic Director your passion for mentorship and leadership intersect with an interest in the business operations of a clinic. The overall success of your clinic is your main focus, a thriving clinic is place full of mentorship, business planning and innovation. As a Regional Talent Lead you have developed a passion for recruiting and attracting new talent to Myodetox. Continuously searching various channels for top talent is the major focus of this role. As a Lead Therapist your skill and passion for delivering Myodetox treatment has others looking to you for education. 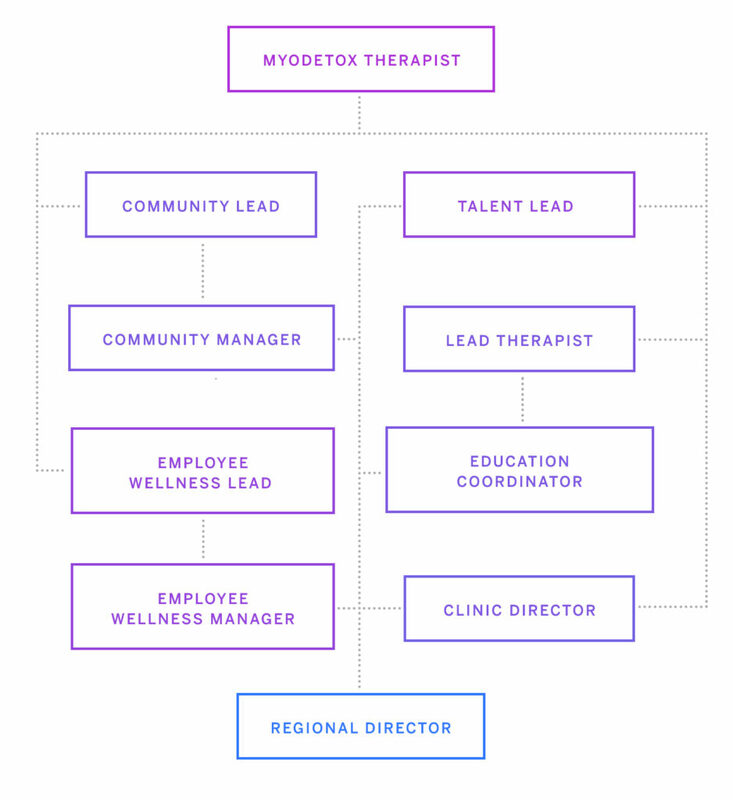 Becoming a Lead Therapist is a role where you can deliver content to our team and communities. 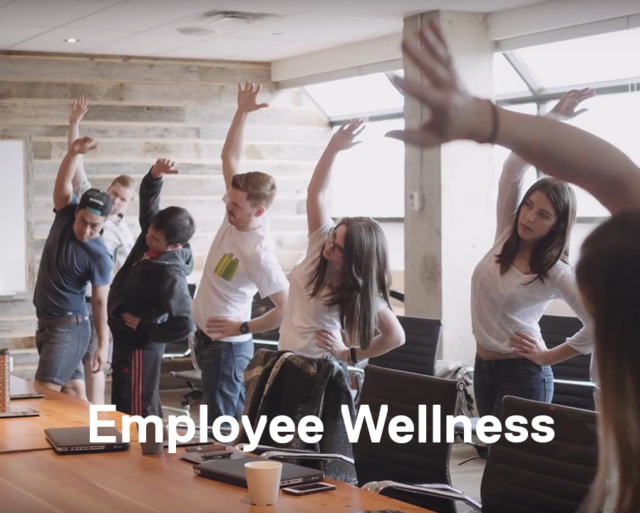 As the Employee Wellness Manager, your focus is on creating initiatives and connecting with corporate offices and building lasting relationships to continually educate and optimize their teams. Inspiring a team and sharing your passion for building relationships is your focus. 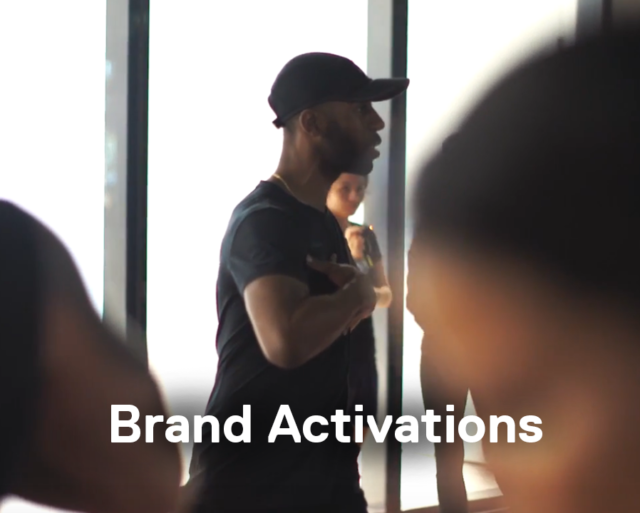 Spearheading new and innovative company wide initiatives is the Community Manager’s focus with the goal of sharing the Myodetox brand. As a Regional Education Coordinator your passion for education has propelled you challenge and push the boundaries of what we know as treatment. You are the go to person for regional training of techniques for the entire team of therapists. Proven as a Clinic Director, the natural progression is to broaden your lens to an entire region. As a Regional Director your focus becomes a group of clinics and mentorship of the Clinic Directors and pushing for the success of the entire region. Working directly with the COO and with other RDs to carry out strategy. I was looking to join a team of like minded people and to work in a non-medical vibe where people could focus on healing. I was excited to become the Regional Director of Vancouver because my goal is to give back to the therapist team as they contribute so much day to day. My interest in continually growing pushed me to want a greater understanding of the successful operation of a business, and ultimately I want to perfect the role of a Regional Director. The principles that guide me everyday as a Regional Director are continual learning and leadership. I first heard about Myodetox through a classmate and I was immediately intrigued. When I first got out of school I thought I had no chance of joining Myodetox, however I took a leap, got an interview and here I am now. The Community Manager role really matched my strengths of being a connector and always innovating. I love this role as I can be creative without any limits all the while still feeding my need for being social. Becoming a Clinic Director was such an honour, I gained valuable experience as a Community Manager which allowed me to be a leader for my team in clinic. With my dual role I love to emphasize ambition and connection as my guiding principles at Myodetox. I first was introduced to Myodetox through someone in the company. I joined Myodetox as I wanted to learned and share my experiences with a growing company. When the opportunity to grow into a Clinic Director at Markham came up, I knew it was the position for me. Being a Clinic Director is really rewarding for me because I can mentor my team and draw on my experience to teach new skills. Being patient during the learning process is what I teach my team and it’s the most rewarding when I see them excel; others’ success is what motivates me everyday. I go about my day to day following my guiding principles of patience and positivity, and that has allowed me to succeed as a Clinic Director at Myodetox. We aim to make a difference in people's lives by educating and empowering others to live healthier so they can lead a life with unlimited potential. Don't stay stagnant, keep pushing yourself, stay humble and keep innovating. A family-first atmosphere is essential to our beliefs of building a great company. We dream big but strive to build a team culture that is grassroots. Trust your perspective, lead your life with purpose that defines you and above all else, do the right thing. Let your passion and personal determination to make an impact on people’s lives be your North Star. Work as a team, lead as a winner. There are no individual victories because an accomplishment is more significant when it's achieved together. Have something more to offer? If you admire our culture and are you’re ready to roll up your sleeves, we’d love to meet you. Don’t see anything that 100% matches your skills? Introduce yourself!